New Olympic sports: Sports fans, rejoice—the days when sports had to fight each other for Olympic survival are over. Squash vs. Baseball! Wrestling vs. Golf! Good riddance to the days when sports had to fight each other for Olympic survival. 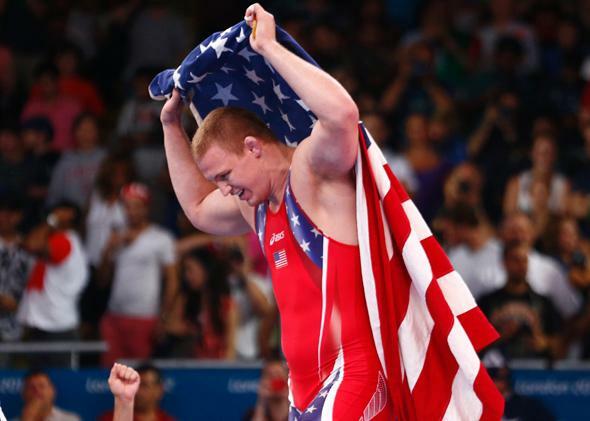 Jacob Stephen Varner of the United States celebrates after defeating Ukraine’s Valerii Andriitsev on the final of the men’s 96Kg Freestyle wrestling at the London 2012 Olympic Games on Aug. 12, 2012. Last week the International Olympic Committee passed a package of sweeping reforms, including allowing multiple cities, or even multiple countries, to share hosting duties. From a sports perspective, the most significant move was to get rid of the frustrating 28-sport cap that prevented new athletic events from being added to the Summer Olympics unless existing ones were eliminated. The cap, introduced in 2002, was controversial from the start. Touted as a way to reduce costs, its economic merits were always suspect, and it seemed destined to create animosity between existing and would-be Olympic sports. Those concerns proved spot-on: Hosting costs have continued to balloon, and pitting sports against each other fostered a culture of ugly infighting. As ludicrous as this one-goes-in, one-goes out scheme may seem, it had serious consequences. Sports that got voted out of the Olympics, as baseball and softball did in 2005, lost their chance for a major international stage and faced losing their national funding, which is tied to Olympics participation in many nations, including the U.S. The cap was arguably even more detrimental to campaigning sports, some of which have spent decades and millions of dollars in their bids to get into the Summer Games. (There is no such event cap in the comparatively small Winter Olympics, which seems to concoct new, extreme events every four years in an attempt to cultivate a younger audience.) Not only did it increase the already high barrier for making the Olympics, it forced wannabe sports to root for the demise of entrenched ones. In the event that an “old sport” did get eliminated, it was allowed to campaign for reinstatement. In 2013 squash, which has been trying to get into the Olympics since the 1980s, found itself facing off against wrestling (the eventual winner) and a joint baseball/softball entry. Of the three “new sport” finalists, squash was the only one that was actually new. It would be one thing if the sports cap had achieved its purported goal of easing the financial burden of hosting the Olympics. Instead, host city costs have escalated to an absurd degree. These spiraling costs have little to do with the number of sports being offered. London spent more than $1 billion on security when it hosted the Summer Olympics in 2012, and security fees reportedly cost $3 billion at the 2014 Winter Games in Sochi, Russia. Limiting the number of Olympic sports was never just about saving money, though. There was also the matter of controlling the size of the Olympics, particularly the Summer Games, which some IOC members worried had gotten too big. The 1980s and 1990s had been a period of expansion for the Olympics, a reflection of efforts to make the games more inclusive of women and athletes from non-Western countries. Seven sports were added to the Summer Olympics during these decades, including table tennis, badminton, taekwondo, baseball, and softball, all of which are popular in Asia, Latin America, or both. By 2002 the mostly European and male IOC had changed its tune. It began publishing reports that recommended against the addition of new sports and events, even when the new event was a women’s version of a male-only sport, such as boxing. By the end of that year, the clampdown was official: The Olympics would be limited to 28 sports, 300 events, and 10,500 athletes, leaving no room for growth. Before 2002, getting added to the Olympics program was like earning tenure at a university—it took a long time to achieve, but once attained it was permanent. A sport hadn’t been taken off the program since 1936, when polo was removed. That stability went out the window under the new system, in which IOC members would vote yea or nay on all 28 sports in the Summer Olympics. (Again, the Winter Olympics, which only had seven sports at the time, wasn’t subject to this process). The ballots were secret, and the results were final—any sport that didn’t receive a majority of yeas would be out. Not everyone in the IOC was on board with the new policy—Anita DeFrantz, one of the IOC’s few female members, was one vocal critic. In theory, all 28 sports had an equal chance of surviving the first elimination vote, but in practice some sports were on much shakier ground than others. Athletics and aquatics, which are categorized as single sports even though they contain all track and field, swimming, and diving events, were too large to get voted out. Paradoxically, it was the smaller, standalone sports—the ones that would free up the least amount of event and athlete slots if eliminated—that wound up being the most vulnerable. Of those, baseball, softball, and modern pentathlon had the most to fear going into the 2005 vote, as they had already been singled out by the Olympic Programme Commission, which had proposed getting rid of them to make room for golf and rugby sevens. The 2005 vote was extremely close: Baseball came up short by three votes, while softball missed the majority cutoff by just one vote. Some blamed the results on anti-American sentiment, which was high that year because of George W. Bush’s re-election and the Iraq War. The U.S., though, was hardly the only country hurt by the decision. Baseball’s elimination deprived Cuba and Taiwan of one of their few opportunities to medal at the Olympics (Cuba had won gold in the event three times), and the loss of softball was a blow for Japan, Canada, Australia, and China, all of which had strong teams. Softball was added to the Olympics to provide a female counterpart to baseball, just as it does at the high school and college levels in the U.S. But in the Olympics, softball and baseball were considered separate sports, which meant their removal opened up two spots on the program. When the IOC voted to determine which new sports would fill those spots at the 2012 Summer Olympics, however, there were no winners. Not only did golf and rugby sevens not make the cut, they received fewer votes than squash and karate. As a result, the London Games featured only 26 sports—two fewer than the maximum—and none of them were new. And yet, despite some IOC members’ assertions that “the addition of new sports and disciplines to the programme is the number one factor for increased cost and complexity of the games,” the London Olympics still wound up being several billion dollars over budget and exceeding the limits on events and athletes. Golf and rugby sevens eventually made in onto the program for the 2016 Summer Olympics, thanks to a new rule that allowed the IOC Executive Board to narrow the list of candidate sports down to two before the vote took place. Then, in early 2013, the 15-member Executive Board held a vote to affirm what it had recently designated as the “core sports”; if one were eliminated, a new sport could be added for the 2020 Summer Games. Aquatics and athletics, which together account for 93 events, were still untouchable. Modern pentathlon, which, like baseball and softball, features only two events—one men’s and one women’s—was on the chopping block again. Also vulnerable were taekwondo, fencing, and field hockey. But, to the surprise of many, it was wrestling that got the ax. The wrestling debacle, however frustrating, was ultimately a very good thing: It took such an over-the-top screw-up to kill the sports cap. Under the reformed rules, the IOC can make room for new sports by trimming or reconfiguring events rather than removing entire sports. That means there’s a chance squash and baseball/softball could make it onto the 2020 Olympics program after all. No matter the specific rules, there will always be more sports wanting to get into the Summer Olympics than can possibly be included, especially if the IOC continues to limit participation to 10,500 athletes. But at least now the would-be Olympic sports will have to compete only against each other, and the existing ones can focus on making improvements rather than trying to figure out who’s waiting to stab them in the back.